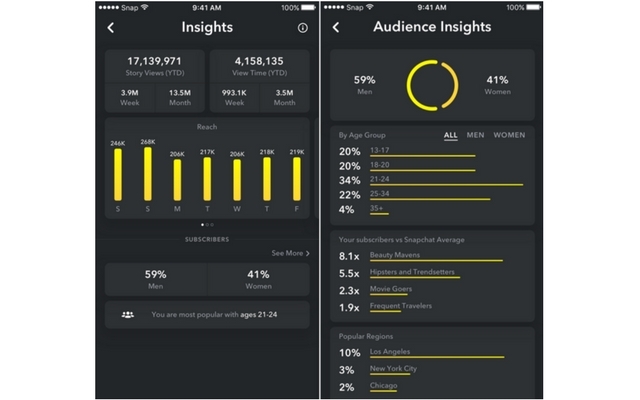 Snapchat Adds Audience Analytics to Lure Creators Back, but is it Too Late? It’s been a tough fight between Snapchat and Instagram for the past few years to get the lion;s share of the audience attention. Yes, Snapchat may have introduced ‘Stories,’ but Instagram is just a better platform when it comes to influencers and creators as it offers better analytics and audience insights. Snapchat has always been terrible at analytics, which is something the company is now looking to change. Total Story Views: This can be filtered to show the views from past week, month or even a year to date. Time Spent Viewing Stories: This is the total amount of time spent by your audience viewing your stories. Audience demographics: This will show you the gender breakdown, top age bracket, and top geographic regions. Audience interest: This particular option will help you understand what your audience cares about. The new detailed analytics panel is definitely good news for all both influencers and brands. Creators can offer brands more specific data on who they’re reaching, whereas brands, on the other hand, can pick and choose the right creator to target their niche. That being said, the update comes at a time when the users are more frustrated than ever with Snapchat. In fact, a lot of creators have already migrated from Snapchat to Instagram. A lot of influencers like Kylie Jenner, MKBHD, etc. have already raised their voice against the new redesign as well as frustratingly poor analytics option the platform had earlier. While it looks like it might be a little too late, and that Snapchat has other issues to resolve, the analytics entry is still a milestone for Snap. It may surprise everyday users, some brands have found that the new redesign has actually had a positive effect on Story views. Nick Cicero, CEO of analytics company Delmondo, says he’s seen an increase in engagement for both Discover publishers and verified accounts since the redesign. So maybe, just maybe, the creators will appreciate Snapchat’s efforts and come back on-board. But at this point, that’s still a long way away. After all, the last thing you want as a creator is to make your audience go back-and-forth between different platforms. Let us know your thoughts on this. Do you think Snapchat is a little late to the party? Shoot your opinions in the comment section down below.